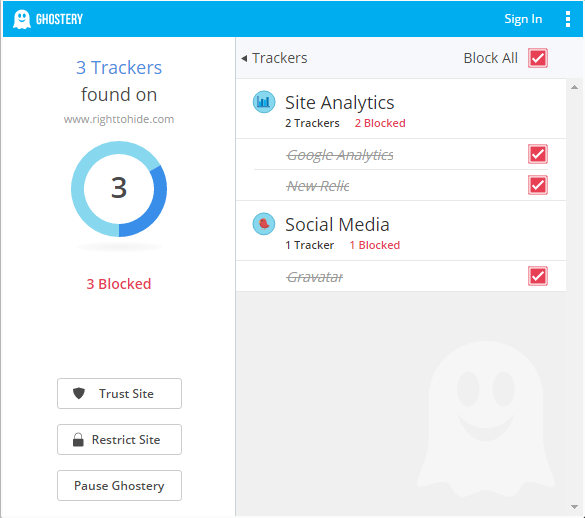 Ghostery prevents advertisers’ and other companies’ trackers from keeping tabs on which sites you visit and what you browse on the Internet. The service is free, however Ghostery is owned by a private company which makes money from selling page visit and blocking data. It is not open source and plugins of browsers have access to all the data of the visited websites. browsing in incognito could be a substitue for this. 2. By clicking on the blue ghost Ghostery icon you can check the trackers found by the extension and you can choose which ones to block. Lock “Allowed”: the tracker is allowed permanently on the site. 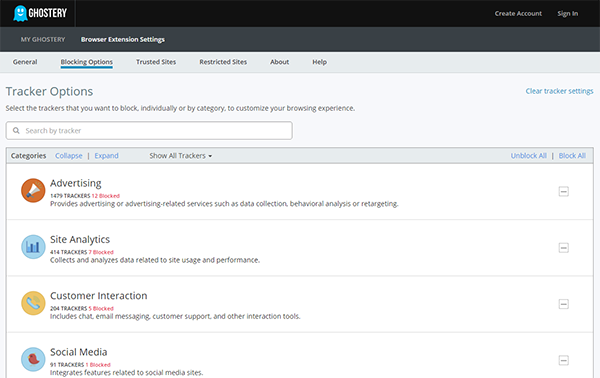 By clicking ”Pause blocking” you can temporarily allow all trackers on the site you are visiting. The “Whitelist Site” button allows all trackers until you undo whitelisting. Clicking the to the part of pie chart icon, you may choose what types of trackers you would like to block. 3. Clicking the to the part of pie chart icon and choosing Option, you may choose what types of trackers you would like to block. Customer interaction:Includes chat,email messaging, customer support, and other interaction tools.